Rev. Sam Wilder is 52 years old and married to Jennifer. They have been married for 23 years. They have four children, Garrett, Cole, A.J. and Kayla Rose. He has been in the ministry for almost 30 years having served as an Associate Pastor, Senior Pastor, Conference Evangelist and Christian School Administrator. His most recent service has been Senior Pastor of the Glennville and Hopewell United Methodist Churches where he has been for the last four years. 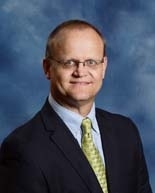 During his years as a United Methodist Minister he has served in a number of leadership positions within the South Georgia Conference. He served as a Chairperson of the Committee on Evangelism, as a member of the Congregational Development Task Force, as a member of the Commission on Equitable Compensation, and as a delegate to the Sixth International Evangelism Seminar of the World Methodist Evangelism Institute. He was the recipient of the Denman Evangelism Award in 1993 in recognition of his work in Evangelism and Missions. He is a graduate of Georgia Southern University and Candler School of Theology at Emory University. It is Rev. Wilder’s passion to be used by God in encouraging, motivating and equipping the local church to claim her identity and fulfill her divine destiny as a living expression of God’s love to a hurting world. Ms. Grogan has served as Administrative Assistant for the Waynesboro First United Methodist Church since November, 1990. She attended Georgia Southern College where she received a Secretarial Degree. Ms. Grogan is an active member of the Georgia Chapter and the National Organization of Professional Association of United Methodist Church Secretaries. In 1999, she became a certified United Methodist Church Secretary, completing this course at Emory University. Ms. Grogan has held several positions in the Georgia Chapter and was named Church Secretary of the Year for 2002-2003. In 2016 she will serve on the Finance Committee of the local chapter. Mrs. Grogan was married to Early Monroe (Jack) Grogan, Jr. until his death in 1992. She has two children, Wanda Shyrock and Alan Grogan, and four grandchildren. Ms. Grogan is a member of the Waynesboro First Baptist Church. Ms. McCook has served in ministry at Waynesboro First United Methodist church since January 1999. Prior to her arrival to Waynesboro, she worked in the nursery/children's ministries at First Baptist, Vidalia, Georgia. She is a graduate of Brewton Parker College, having completed a Bachelor of Arts Degree in Music with a Concentration in Vocal Performance in June, 1998. Ms. McCook is the daughter of Rev. Tom & Dian McCook. Rev. McCook is a former pastor of WFUMC and served in the South Georgia conference for 34 years before retiring in 2012. Mrs. Stanford has been Church Organist and Pianist since October, 2011. She began her music ministry at Beech Haven Baptist Church, Athens, Georgia, serving in an interim capacity as music director in 1978. She served as music director at Garner United Methodist Church, 1980-81 and Aversboro Road Baptist Church in the same city, 1981-1985. She was the assistant to the minister of music at First Baptist Church, Tallahassee, Florida, 1985-86. After moving to Charlotte, North Carolina she was called to serve as music director at University Hills Baptist Church, 1986-88. She accepted a call to serve as music director at Mallard Creek Presbyterian Church for 12 years, 1989-94 and from 2002-07. Between these two tenures at Mallard Creek she served as music director in a new church development for the Charlotte Presbytery. She also served for one year at Derita United Methodist Church in Charlotte. Since "retiring" to Waynesboro, she has served as music director/accompanist for First Presbyterian Church. She studied voice at the New England Conservatory, Boston, Massachusetts from 1965-66. She attended Georgia Southern College from 1969-71 and Augusta College while she taught Senior English at Curtis Baptist High School, 1975-77. She has sung with major oratorio groups in Athens, Raleigh, Tallahassee and Charlotte, where she was a member of the Charlotte Festival Singers from 1999-2007. This vocal ensemble was invited to perform at the Spoleto Music Festival in Charleston, SC for many years. She married Ken Stanford at Fleming Baptist Church, Augusta in 1972. They have two grown sons, Kevin and Geoff, both who live in North Carolina. Mr. White has been the Director of Youth Ministries since October 2015. Mr. White is a Fire Fighter Paramedic at the Burke County Emergency Management Agency where he has been employed since 1992. He retired from the Navy Reserve in February 2015 after 25 years of service as a Senior Chief Petty Officer. Mr. White is the Father of James, Jacob and Joseph White. He has been married to Mrs. Jennifer Jenkins White since July 23, 1994. Mrs. Jenkins has been the Director of our Preschool ministries since . . .
Mrs. Seay has been a teacher for our Preschool Ministries since . . .